Exclusive limited edition mixtape featuring the legendary Egyptian Lover (Egyptian Empire/Stones Throw) and Hotthobo (Voltaire Records/Hobo Camp). 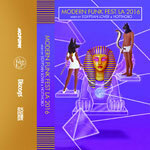 Modern Funk Fest was started in 2014 by one of the genre's brightest stars, Brian Ellis, in his native San Diego. It then moved northward to LA, then to SF, back down to SD, and just had its fifth installment in Los Angeles at the Echo on May 13th, 2016. Here, we bring you an exclusive limited edition mixtape featuring the legendary Egyptian Lover (Egyptian Empire/Stones Throw) and Hotthobo (Voltaire Records/Hobo Camp). Egypt's Mix includes classic music from Egypt himself, Midnight Star, Kraftwerk, Prince, and many more, as well as original Vocoder and Vocal Performances and a Synth Solo from XL Middleton. Hotthobo's Mix features brand spanking new and mostly unreleased modern funk jams.